When British composer Ralph Vaughan Williams died in 1958, his reputation among many critics had sunk lower than the grave. To this day, it's not all that high, but one sees encouraging signs. 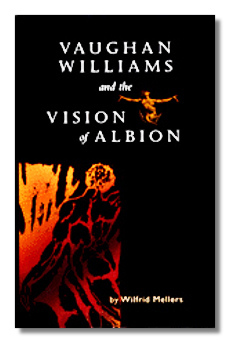 Soon after his death, two major "official" studies appeared: Michael Kennedy's classic The Works of Ralph Vaughan Williams and Ursula Vaughan Williams' R. V. W., the first comprehensive biography – both published by the composer's own Oxford University Press and both still essential to a basic understanding of the composer. For over twenty years afterwards, no significant study came my way, and I doubt that many graduate theses concerned themselves with the composer's works. Still, the long silence seems to have broken at last with Alain Frogley's Vaughan Williams Studies (Cambridge University Press) and this volume by the distinguished musician and critic Wilfrid Mellers. I read Mellers's Music in a New Found Land, a magisterial survey of American music, many years ago. The details in my head have fuzzed up quite a bit, but I remember thinking of him as an aggressive Modern, just the sort to beat Vaughan Williams over the head with a heavy stick. Happily, I admit I mistook him. Indeed, Mellers makes claims for the composer that will raise more than a couple of eyebrows. I admit some of them raised mine over my ears. Still, I love reading a passionate advocate, for such a person can articulate the appeal of a composer – in other words, the most important thing about the music. Mellers certainly qualifies. The book, I believe, requires some basic technical knowledge, mainly first-year harmony and the ability to read music, in order to grasp many of the author's points, but perhaps one can get the gist by following along with recordings. Neither a comprehensive survey of Vaughan Williams' enormous catalogue nor a recounting of his long career, the book attempts nothing less than to explain why the music works on us as it does and, to some extent, what it means. In my opinion, Mellers tries the impossible, but a hard, serious run at some unreachable goal often produces brilliant results, even in failure, as I believe has happened here. Mellers acknowledges his debt to the great Deryck Cooke's Language of Music for much of his approach and many of Cooke's conclusions. The critical procedure particularly suits Vaughan Williams, as it would suit any "personal" composer, like Shostakovich. Vaughan Williams grumbled throughout his career about speculations over the "meaning" of his works. The symphonies four to six especially provoked interpretations of prophecy about the coming of World War II, the vision of peace, and postwar nuclear holocaust, respectively – all of which Vaughan Williams vehemently denied. "It never occurs to people that a man might just want to write a piece of music," he said. But it was his own fault. Many feel that music that powerful must mean something. Mellers tries to get at what. I like it that Mellers doesn't make a neuro-physiological argument for meaning – namely that specific music must work on us in a certain way because of how all humans are wired. It may turn out true at some deep level, but in the darkness of current physiological ignorance, such a claim becomes pretentious. Instead, as with Cooke, he notes conventions of musical expressivity throughout the centuries. Music is, after all, something made. A composer invents a turn that seems appropriate to him. Others note the invention or assimilate it without conscious thought and extend it in their own work, creating an emotional cluster from a family of such invention. The cluster eventually becomes a vital convention or dies as a cliché. Furthermore, a composer of genius can resurrect cliché to something again alive, as the case of Brahms, Mahler, or Stravinsky amply demonstrates. Michael Kennedy, following certain remarks about the Fifth Symphony and the Bunyan opera provided by composer himself, identified many of Vaughan Williams' key gestures, notably the opening to the hymn Sine Nomine. Mellers identifies even more and comes up with a list of archetypal works: Sine Nomine, Toward the Unknown Region, the Sea Symphony, the Tallis Fantasia, The Lark Ascending, Sancta Civitas, Job, Serenade to Music, Symphonies 3 through 9, Hodie, The Pilgrim's Progress, and the 10 Blake Songs. Because these motifs occur in vocal works with words and "plot" attached, one can get a general sense of emotional locus when they appear "abstractly" for instruments alone. In Mellers's view, Vaughan Williams' output becomes a vision of his country, of humanity in general, and of the noblest occupation of the mind. Is it really all that superficial a similarity that so many of his works speak of the journey of the soul toward enlightenment? I doubt it myself, especially when Mellers goes on to illustrate how the "message" changes over the composer's career. Vaughan Williams almost never gives us an answer. He typically ends his work either on a question or on the serene acceptance of what we don't know. The nature of the questions and the condition of the acceptance change from work to work. Vaughan Williams may have been, in Bertrand Russell's reminiscence, "the most frightful atheist" or in (I believe) Frank Howes's phrase, "a cheerful Christian agnostic," but he apparently never totally escaped the Evangelicalism of his ancestors. Mellers gives us a picture of Vaughan Williams' immediate English ancestors – Parry, Elgar, and Delius – and shows us his place against this background. He also discusses Vaughan Williams' literary and artistic influences – primarily Whitman, Blake, Hardy, Borrow, and Palmer, as well as the writings of the Anglican Church – and relates them to the musical work. By any measure, this is an impressive intellectual achievement, and it's elegantly written, besides. Mellers succeeds less well with (to me) a minor thread – Vaughan Williams as a "double man." Mellers gets the phrase from Sir Thomas Browne and goes into a long explanation whose significance, I admit, I don't really see. Apparently, the composer had a complex personality, but so do most adults. Mellers tries to point to Vaughan Williams' bitonality or unstable tonality and his attraction to "double orchestras" as major emblems of this "doubleness." I took them as signs of a more general emotional complexity instead and to that extent I take his point. However, this bobbling doesn't mar the main thrust of an ambitious work. It took me several years of out-of-print searches to obtain this book, but it's well worth it. The editing could have been better, however. Annoying typos litter chapters. Deryck Cooke, for example, is mentioned as "Derrick" in the text, although the index lists him correctly. Copyright © 1998 by Steve Schwartz.